We are Here to Help You with Your Roofing Requirements. SV Roofing Limited are your one-stop shop to make sure your roof stays secure! We use the highest quality materials to ensure longevity. programmes across London and the South East. thereby ensuring full satisfaction in the quality of the installation. SV Roofing & Renovation Limited are Installers of RubberBond Fleeceback Roofing systems. Find Out More. SV Roofing & Renovation Limited are Installers of Westwood Liquid Liquid Resin solutions. Find Out More. Our unique combination of quality materials and craftsmanship provides complete peace of mind for all our customers. Request an estimate. I became a homeowner only a few years ago. Due to the lack of experience in this matter, finding a trustworthy builder turns out to be quite a problem. Well, now it's one problem less for me. Get in touch with Shane and just sit back and relax, watching his team do the magic. They did a fabulous job with the flat roof. Removed the old rendering from the front wall, applied a new one and painted it. Also fixed few other issues discovered in the meantime. The fact that they can do so many different jobs is really a bonus. Top guys, highly recommended! Alan Stevens in west mailling - 25 Mar 16 we had Svroofing out to renew our flat roof. was a very professional company to deal with from start to finish.the whole process was stress free for me and my wife, as Shane informed us every step of the way. would highly recommend Svroofing to any one. Roofing renovation and new installs. Free estimates. Find out more. SV Roofing & Renovation Limited Are a family run business Here to Help You with Your Roofing Requirements. 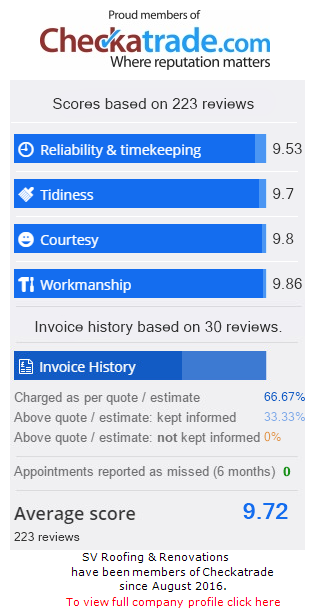 Here at SV Roofing &Renovation Limited we take enormous pride in our work, Reputation and our clients satisfaction. Whether it be a small repair job or a large refurbishment we approach every project with the care, attention to detail and professionalism that has become our trademark. We will engage with the client every step of the way, keeping you informed of progress on a day to day basis. To see some of our Reviews please click here. great service from start to finish. Very professional service, reliable and very tidy workers. I am very happy with the works carried out, and have had no more further leaks. Great service. Would recommend to anyone. We thank SV Roofing for all the hard work they put in. Recommend to anyone looking to renovate their property. Great professional service, well informed at all stages, very polite team of lads. If you want to receive a no obligation estimate from us please call 0800 193 2474 or send us an e-mail.